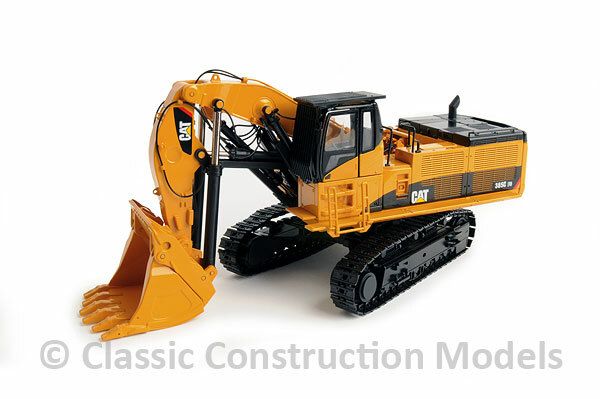 First of all let me say that I'm very glad 3000TOYS had the fore sight to to stock so many of the Caterpillar 385C Front Shovel by CCM, as they seem to be the only seller that still have them in stock at the original price! 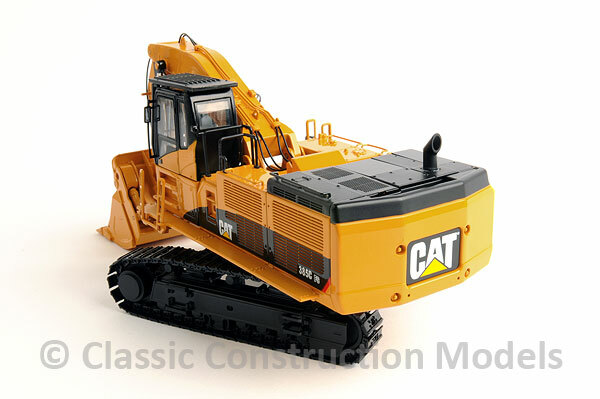 If you are a serious collector of construction models and specifically CAT, this is a must have. I bought mine here, and it was my first CCM diecast purchase. Though it is a bit on the expensive side I have to say it was worth every penny I paid for it. The model itself is quite heavy, weighing in at 2.29 lbs or 36.6 ounces. 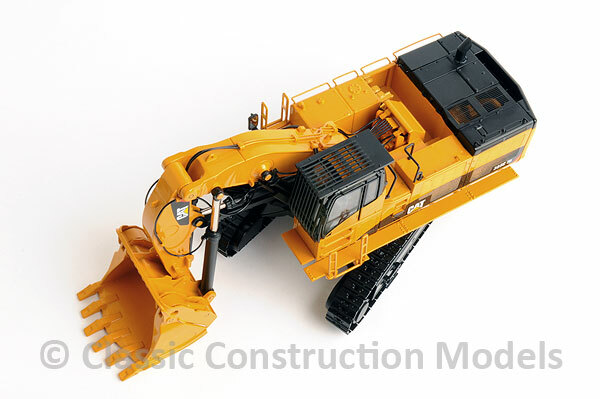 There is almost no plastic to in this model outside of the resin cylinders, hydraulic lines, windows on the cab, interior of the cab, two hand rails leading to the upper deck,and engine. The rest is all diecast metal. The tracks are beautifully done, turm very smoothly, and have tension springs and individual upper and lower boogie wheels and return rollers. Looking at the bottom of the model it is very detailed showing the various insert plates with crisp bolt detail. The cab door opens also opens showing a nice detailed interior and the running boards on each side of the machine have metal having a very fine non-slip segmented patern with vert nice bolt detail and the underneath of these have the support struts casted in also. The engine vent of the driver's side are extremely well done and very fine. Unlike many excavators and shovels the upper rear of the engine deck is also metal with a fine mesh section, an opening metal access hatch, a scale metal grab rail, and a nicely hollowed out exhaust stack. Moving to the right side of the model the rear engine hatch opens, as does a small hatch on the top, to show the engine. Finally the rear counter weight looks great being sharply detailed with very nice deeply sunk attachment bolts. The real showstopper on the 385 is the very detailed boom and shovel with all it's amazing detail. Looking down from the top there are about ten hydraulic hoses leading to through and ontop of the boom. Unlike other models I have there are no messy glue globs and the thickness of the hoses are done to scale. The hard hydraulic lines on the boom top are separate, not cast in like cheaper models. In addition the the lifting eyes on the boom and stick are part of the casting and have holes drilled in for lifting. 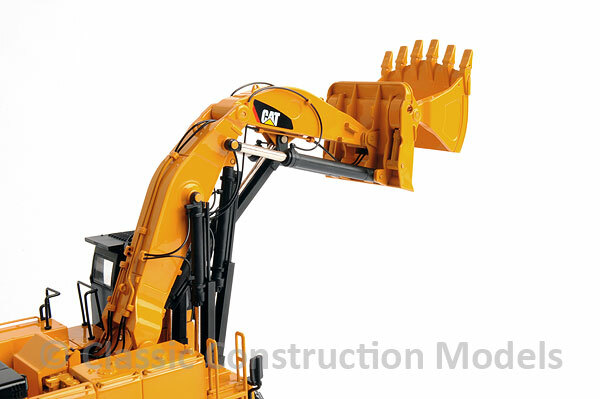 CCM has also done a fantastic job of representing the complicated arrangement of the CAT 385C's hydraulic cylinders with those attached to the boom having nicely detailed guards. 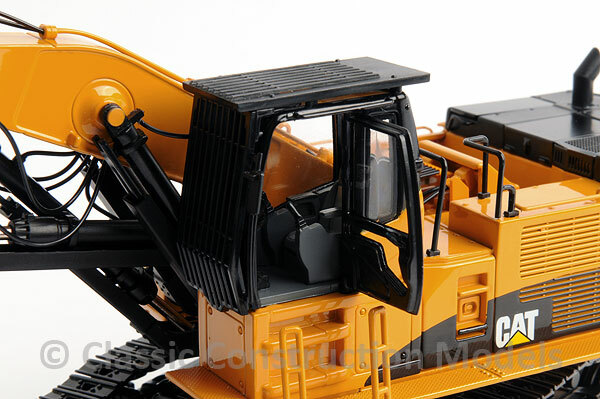 The shovel itself is very well detailed with sharply cast detailed teeth and also detailed hydraulics to open the bucket. One additional thing to note is the attachment joints to the boom, stick and shovel. There are no open rivets as all the joints are attached using what seems to be flat headed pins, painted yellow as on the real machine. Finally the paint job is extremely well done not being too thick as to hide detail and having no blobs or dripping. In addition the decals are done to a very high standard. Again, if you like CAT equipment and want one of the best at an affordable price CCM's Caterpillar 385C Front Shovel is a bargain. The 385C L's and 390D L models are awesome both in looks and in functionality! They look like the real thing when put into a dioroma! CCM needs to make more "Newer" 1/50 scale models like this because these are outstanding!